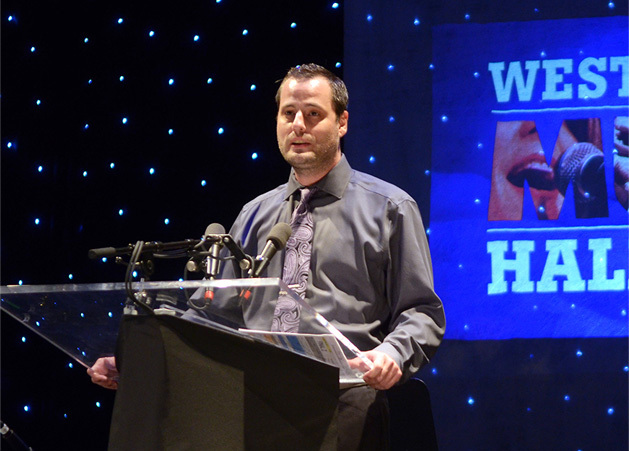 Mountain Stage producer Adam Harris welcomes the audience to the ceremony. 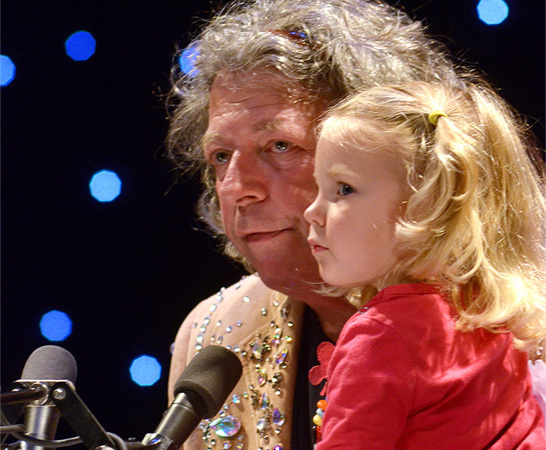 WV Music Hall of Fame Executive Director Michael Lipton gets an assist from daughter, Lulu, during his opening remarks. 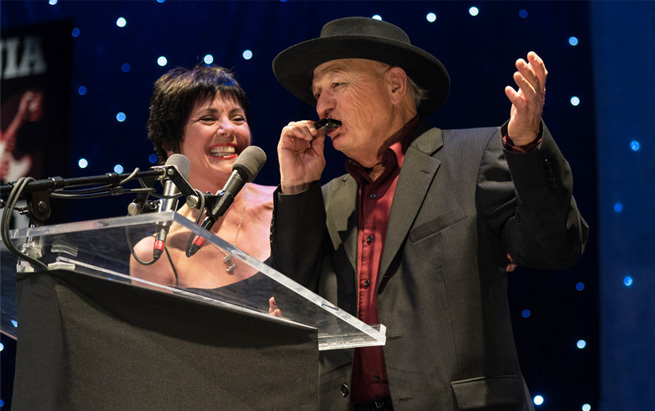 Actress and WV native Joyce DeWitt and Hall of Fame Inductee Charlie McCoy hosted the evening. 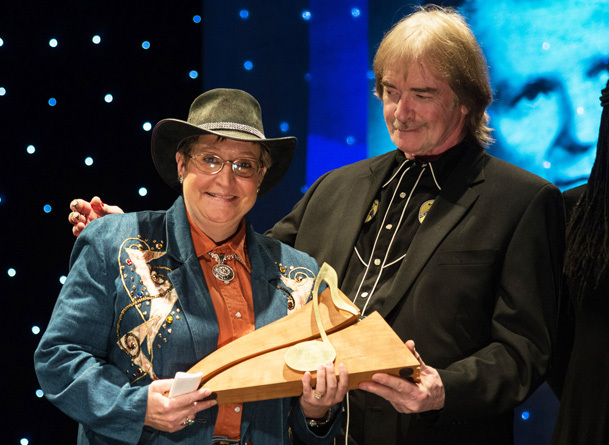 2015 Inductee Russ Hicks presents the award for the late Buddy Starcher to his cousin, singer Stephanie Spinks. 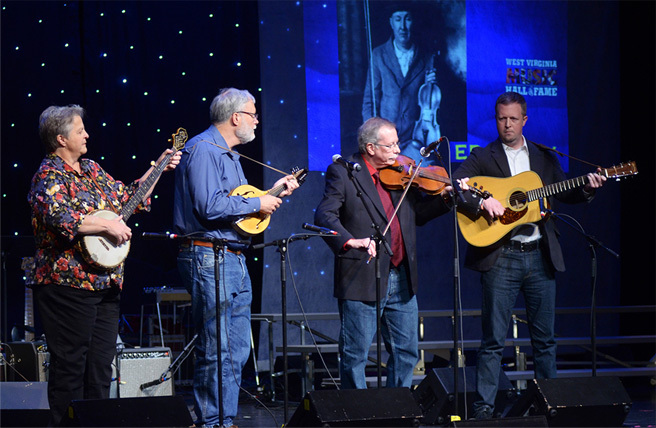 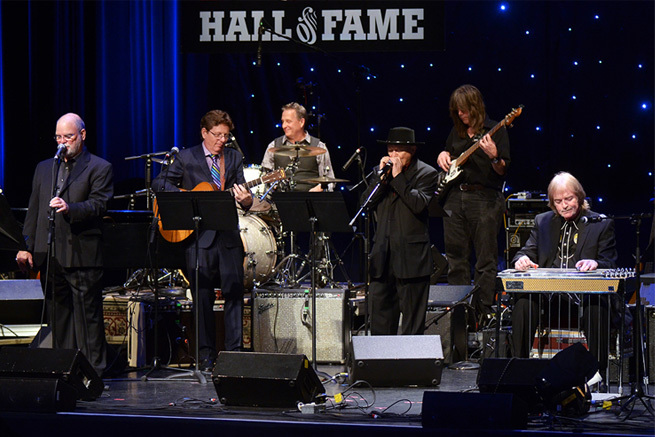 Performing songs associated with 2015 Inductee Buddy Starcher were, from the left, Larry Groce, Tim O’Brien, Ammed Solomon, Charlie McCoy, Ted Harrison and Russ Hicks. 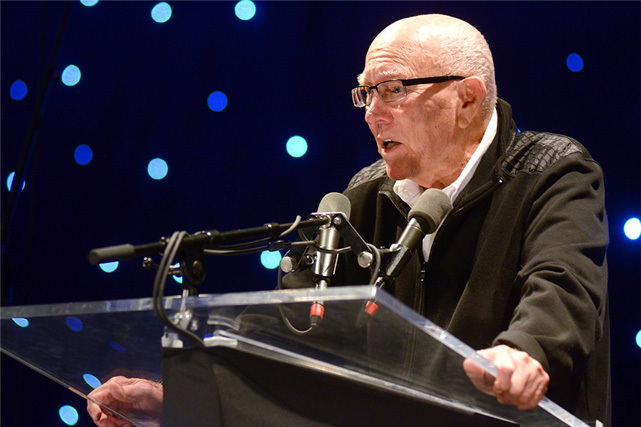 2013 WV Hall of Fame Inductee Wayne Moss offered remarks about his long-time friend and collaborator Russ Hicks. 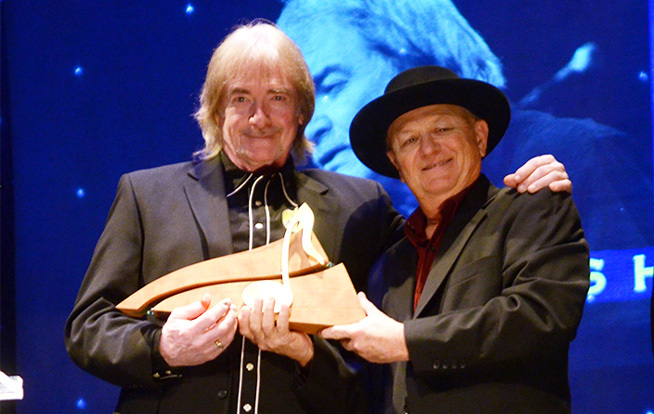 2008 Hall of Fame Inductee Charlie McCoy, right, presents the award to his friend and 2015 Inductee Russ Hicks. 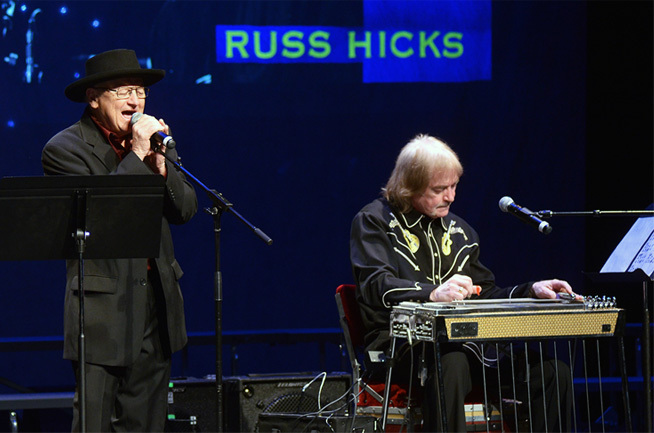 Charlie McCoy and Roger Hicks joined Russ Hicks and Barefoot Jerry to perform three songs during Hicks’s induction segment. 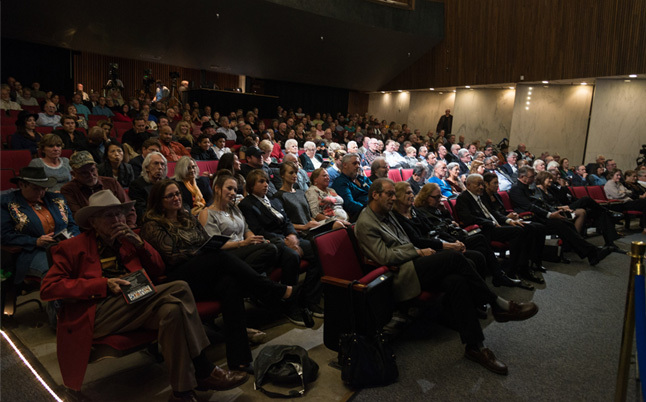 The Induction Ceremony drew a large and appreciative audience. 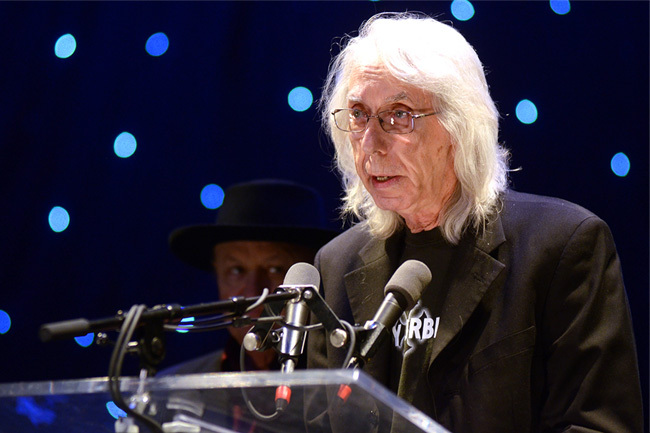 NRBQ founder and keyboard player Terry Adams offered comments about 2015 Inductee the late Harry Vann Walls. 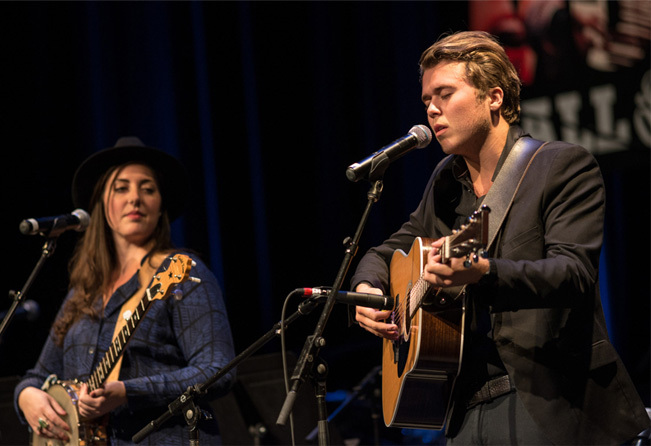 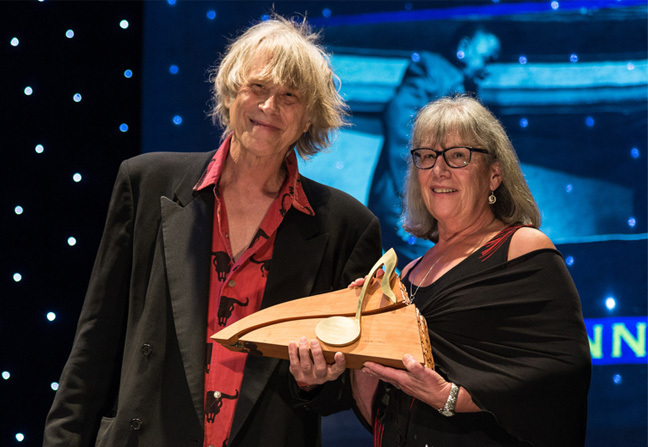 NRBQ’s Terry Adams presented Harry Vann Walls’s award to Franceen Palevsky-Breault. 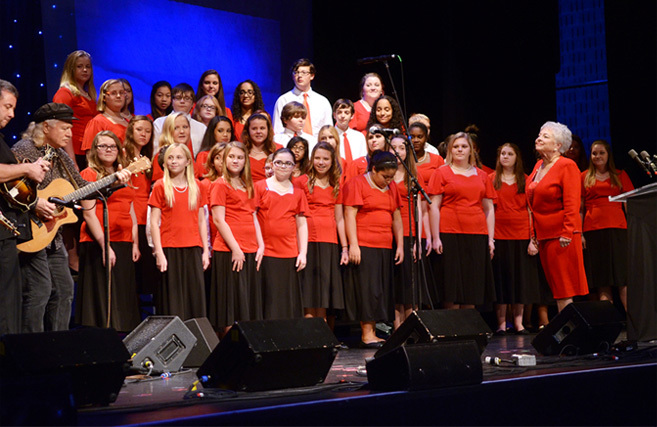 Inaugural Hall of Fame Inductee Billy Edd Wheeler presented the 2015 Spirit Award to Selina Midkiff and The Appalachian Children’s Chorus. 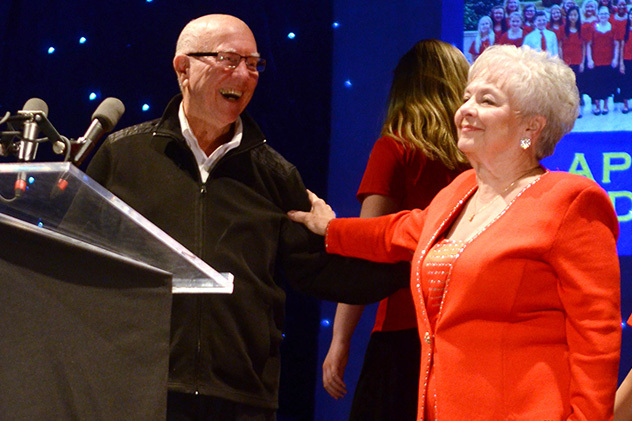 Billy Edd Wheeler introduces 2015 Spirit Award winner Selina Midkiff of The Appalachian Children’s Chorus. 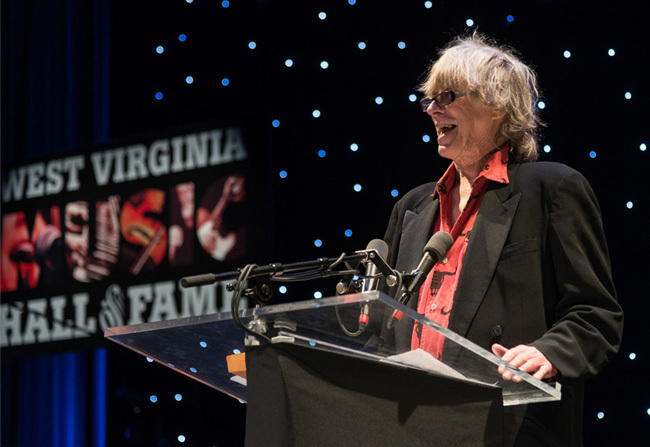 2013 WV Music Hall of Fame Inductee Tim O’Brien presents Ed Haley’s posthumous award to Steve Haley. 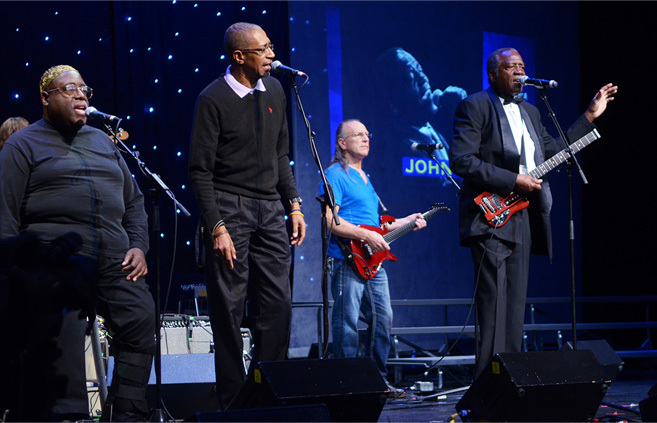 The late Ed Haley’s “Three Forks of Sandy” was performed by Kim Johnson, Bobby Taylor, Andy Dunlap and John Preston. 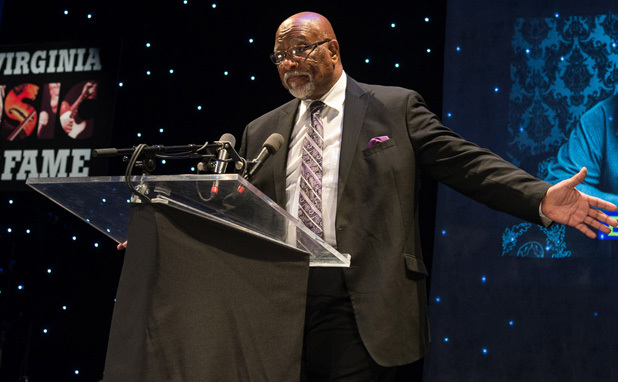 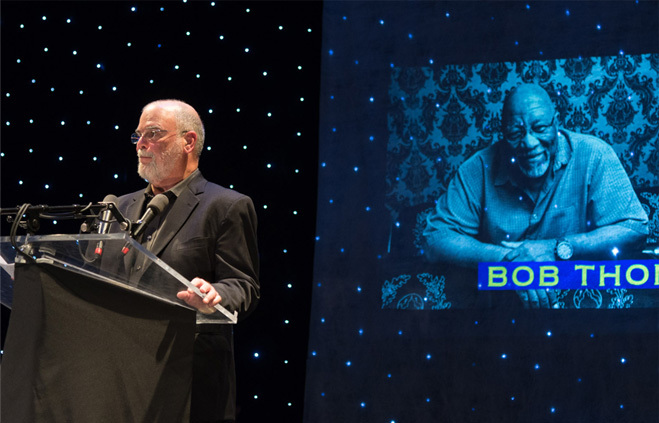 Mountain Stage host Larry Groce introduced 2015 Inductee Bob Thompson. 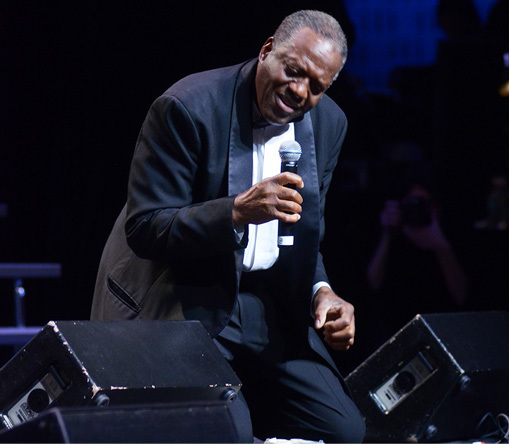 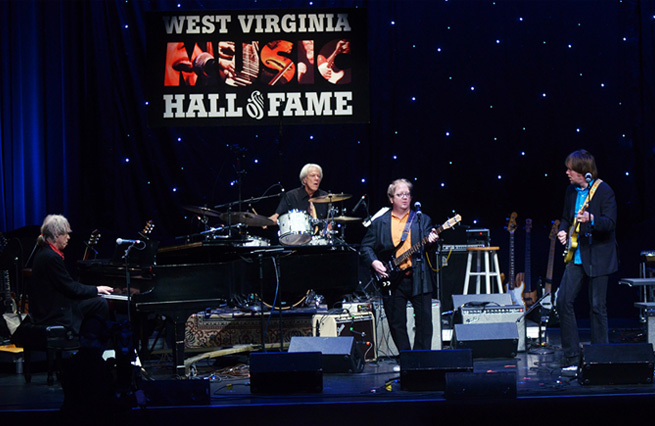 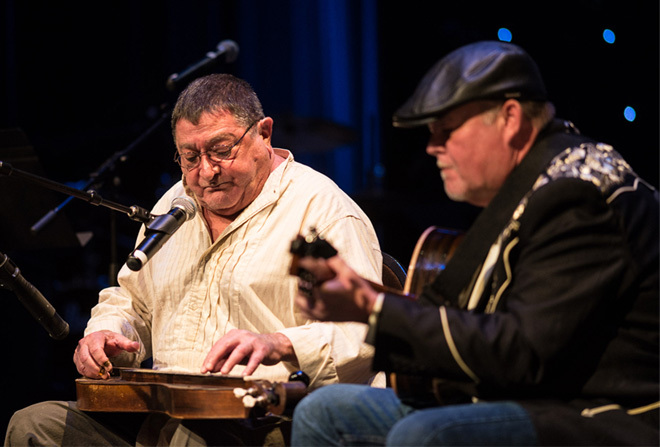 2015 WV Music Hall of Fame Inductee Bob Thompson reflected on his long career in music. 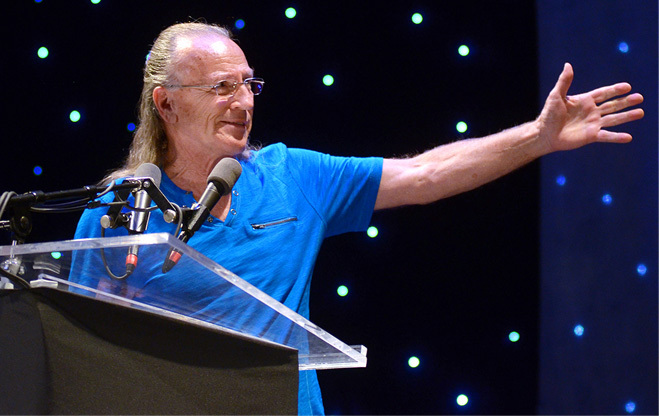 Mark Farner of Grand Funk Railroad introduced 2015 Inductee John Ellison. 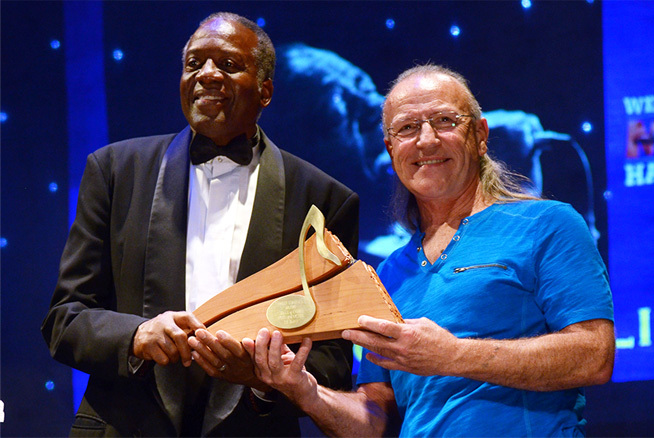 Mark Farner presents the Hall of Fame Induction award to John Ellison. 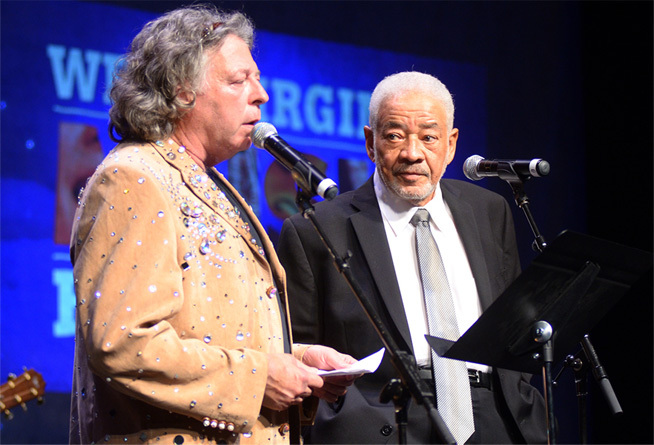 Inaugural Hall of Fame Inductee Bill Withers was in attendance and was recognized for his induction into the Rock ’n’ Roll Hall of Fame. 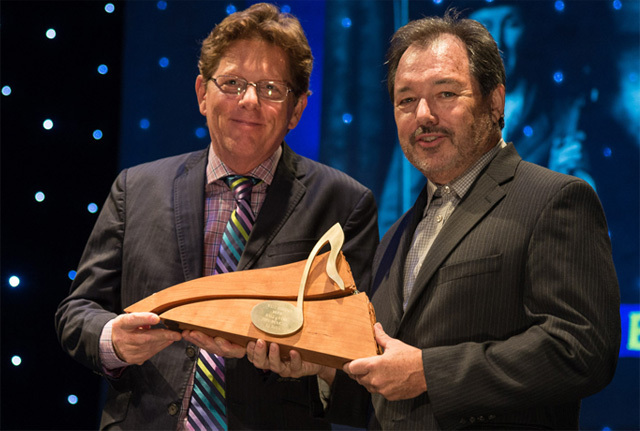 He’s pictured here with Executive Director Michael Lipton. 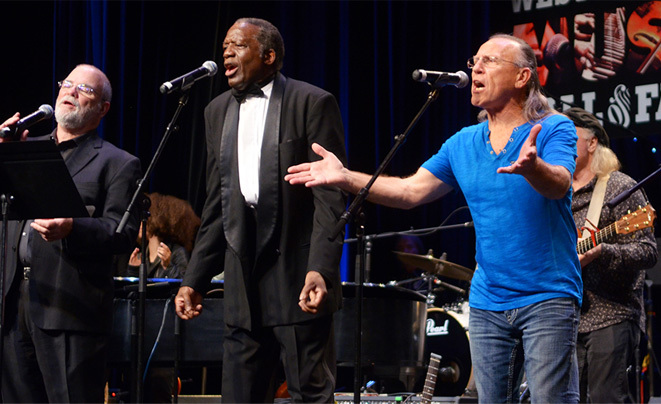 Lending their voices to the finale of “Lean On Me” were, from the left, Larry Groce, John Ellison, and Mark Farner. 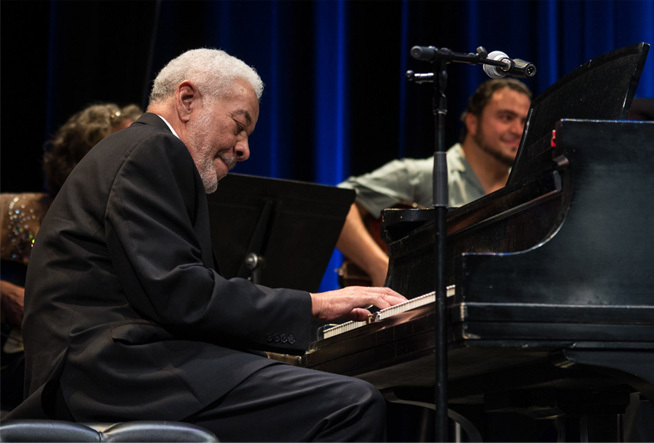 Co-host Joyce DeWitt and Bill Withers during the moving finale.